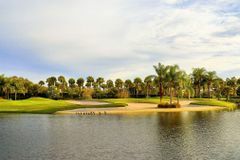 Hawk's Landing Golf Club boasts a glorious 18 hole golf course in Orlando, Florida and provides golfers with the perfect combination of exotic Floridan wildlife and stunning scenery. Designed by renowned golf architect Robert Cupp Jr this beautiful golf course offers a unique playing experience compared to others in the region. Hawk's Landing golf course isn't a modern day monster typically found on the PGA Tour meaning it is perfect for golfer's of all abilities and despite the fact it may not be that long it still manages to create a challenge for even the lowest handicappers. Following the redesign by Robert Cupp Jr. of the original Joe Lee layout, Hawk's Landing combines immaculate conditioning with a friendly layout to provide a great test for all golfers. The 18-hole Championship layout features large Tifdwarf greens, undulating fairways and water in play on 15 holes (including the entire back nine). With a scenic blend of native Florida wildlife and tropical vegetation, including sand pines, queen palms, and fragrant jasmine, Hawk's Landing is a spectacular setting for golf. Four sets of tees offer a good challenge for golfers of all skill levels. Hawk's Landing boasts world-class instruction at the Bill Madonna Golf Academy and also has a putting green and chipping area for golfers to use. The course is located just steps away from Marriott World Centre - Florida's largest resort and convention centre - and just minutes away from all of Orlando’s Theme Parks.